As Election Day approaches and voters across the nation watch Hillary Clinton and Donald Trump debate on a national stage, working people are standing together to call for a nationwide boycott of Trump’s businesses. 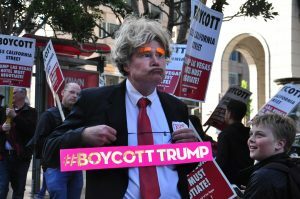 The bold #BoycottTrump campaign calls attention to Trump’s poor treatment and disrespect of the very people who keep his businesses running every day. With the United States Supreme Court, Right To Work (for less) laws, and the founding principles of labor, civil and human rights hanging in the balance, IBEW 1245 kicked off the general election season with a rally that blew the roof off of Weakley Hall! Gov. Brown signed historic legislation, Senate Bill 1234 – Retirement Savings Plan (De León), into law on September 29. Also named Secure Choice, the program will lay down another path to retirement security for nearly 7 million California private-sector workers. For the next month or so you will be seeing candy everywhere. It’s easy to just grab a bag and go, but if you want to support good American jobs, take a look at Labor 411’s list of union-made sweets! In 2011, Antonio Ramirez* was working in one of the Inland Empire’s warehouses. Assigned to clean out a metal freight container, Antonio spent several hours emptying and then sweeping the container, which reached an indoor heat level of over 100 degrees. When Antonio presented with symptoms of heat stroke, his employers failed to take any action to help him. Antonio was forced to call his son to take him to the hospital. He was hospitalized for three days due to heat stroke. Serious contract negotiations are now underway between the University of California system and the International Brotherhood of Teamsters, which represents nearly 14,000 clerical workers and administrative support staff. At issue is a union-proposed, five-year contract that includes six percent annual raises, plus cost of living increases and a freeze on employee parking rates, according to Teamsters Local 2010 spokesperson Christian Castro. We think the provisions in SB 1160 represent an important step in the ongoing effort to ensure a balanced and effective Workers’ Comp system that truly serves those for whom it was created – injured workers. Seventy-seven years ago, in March 1939, Juan Fabian Fernandez of New Mexico opened a session of El Congreso de los Pueblos Mexicanos e Hispanos Americano de los Estados Unidos (National Congress of the Mexican and Spanish-Speaking Peoples of the United States) in downtown Los Angeles. He stood out as the only Latino state legislator present, but he was not the only politico there. Seeking to bring the New Deal to California, Latinos, labor and the left had banded together the previous year to elect a slate of progressives, led by California Governor Culbert Olson. During their marathon “Seniors Vote!” Townhall tour, the California Alliance for Retired Americans (CARA) stopped in Oakland to educate and engage nearly one hundred retirees and activists on the 2016 General Election. The Alameda County Town Hall’s purpose was to invite educational discussion on why the senior vote is vital to the upcoming election, review 2016 California Ballot initiatives, hear from candidates running for regional offices, and promote ways retirees can take action and get involved in the coming election.